TrueUpdate 2.0可以通过Action Plugins来扩展功能。这种插入模式可以代给整个产品无限的功能扩展可能，比如插入对SQLite数据库的支持、XML支持、数字加密等。该功能紧密整合在开发环境中，包括IntelliSense样式代码检验和语法高亮功能，就想在使用内置的脚本编辑器一样容易。该插入Plugins功能可以通过Indigo Rose来提供，也可以使用其他第三方开发工具，再次，感谢Indigo Rose免费提供的插入Plugins开发工具. 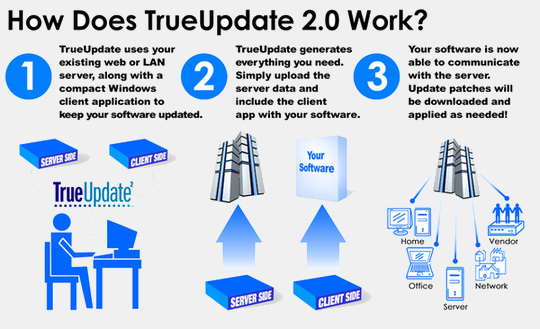 TrueUpdate is a Windows application that provides a sophisticated framework for determining required updates and then retrieving and applying the necessary patch or installation files via the Internet, intranet or LAN. It was designed to meet the demand for a complete, web-enabled updating solution that can be integrated into new and existing software products, regardless of the installation and deployment methods used. Getting your project started has never been easier, thanks to the new Project Wizard. You’ll be walked through each step of the process, including setting up your TrueUpdate Server, choosing download methods, customizing the TrueUpdate Client and configuring your automatic upload settings. The wizard includes dozens of options and project templates to choose from. TrueUpdate 2.0 supports all of the most popular protocols for client/server communication. This includes HTTP, FTP and LAN (both UNC paths and mapped drives), as well as secure connections and file transfers using HTTPS. Full support for HTTP basic authentication, timeouts, ports, FTP passive mode, usernames and passwords is also built-in. TrueUpdate 2.0 now handles proxy servers and firewalls in an entirely seamless and industry-standard manner. All Internet communication is now done entirely through the WinINet API, making it fully compatible with any corporate network hardware and software that supports standard Windows/Internet Explorer functionality. It doesn’t matter what method you plan to use to patch/update the software on the client system. TrueUpdate 2.0 can work with them all. Whether you’re deploying a self-contained patch executable (such as those created by Visual Patch), a single-file installer (like those created with TrueUpdate), zip files, individual data files, multiple binary patch files or whatever else you require, TrueUpdate 2.0 can handle it. We’ve even included a variety of project templates and samples to get you started. TrueUpdate provides many flexible methods for analyzing existing software versions on the client system. It can access the registry, read values from INI files, compare file CRC values, query file version resource information or even use time/date stamps if necessary. Once a version has been identified, TrueUpdate can use a series of actions to bring that version up to date as required. TrueUpdate 2.0 now includes the same scripting engine as TrueUpdate 7.0 and AutoPlay Media Studio 5.0. Based on the popular “Lua” language, this all-new and incredibly powerful free-form scripting engine gives you unprecedented control over your software updating system. This easy to use language features everything from “for, repeat and while” loops, to “if/else” conditions, functions, variables and associative arrays. Paired with the built-in action library, full mathematical evaluation and Boolean expressions, there is simply nothing you can’t achieve. We’ve also built in an “Action Wizard” and “Quick Scripts” feature so you can get right up to speed creating powerful projects to handle even the most demanding update tasks. TrueUpdate 2.0 includes a built-in library of more than 250 powerful yet easy to use actions. There are high-level actions to handle everything from text file editing to system registry changes. You can execute programs, call DLL functions, query drive information, manipulate strings, copy files, enumerate processes, start and stop services, interact with web scripts, display dialog boxes and much more. There is also a full suite of file download actions including FTP, HTTP and secure HTTPS transfers, including new automatic support for firewalls and proxy servers. You don’t have to be a wizard to create powerful update systems with TrueUpdate 2.0. We’ve built the wizard into the software! Simply choose the action you want from a categorized list (complete with on-screen interactive help), fill in the requested information fields and the wizard does the rest. Making changes is just as easy. Click on the line you want to change and press the “edit” button to go back to the original form. It’s really that easy. The TrueUpdate 2.0 script editor features all of the professional features you’d expect. There’s color syntax highlighting, code completion, function highlighting, as-you-type action prototypes, Ctrl+Space function listings and even context-sensitive help. If you’re used to programming in Microsoft? Visual Basic, Microsoft? Visual C++ or any other modern development language, you’ll be right at home. TrueUpdate 2.0 gives you nearly unlimited flexibility in designing the user interface. You can choose from a fully interactive wizard, a minimal dialog box style, a completely silent approach or a “silent until update available” system. Additionally, thanks to the new screen gallery and manager, you can choose from over 25 ready to use wizard-style dialogs, or customize them to fit your needs. With a library of more than twenty-five different screen templates to choose from, TrueUpdate 2.0 is miles ahead of both previous versions and the competition. There are pre-built layouts to handle just about any task you can dream up, and it’s easy to adjust them to fit your needs exactly. You’ll find check boxes, radio buttons and edit fields to popular screens like license agreements, folder selection and other advanced options. The Screen Manager allows you to add and remove screens at will and adjust the sequence with a simple drag-and-drop motion. Each screen features a real-time preview so you can see the result of your changes as you work. Choose from over twenty included themes (skins) for your project or even make your own. It’s as easy as viewing a live dialog preview and picking your favorite style. You can configure everything from fonts (face, color, size, style) and banner images to body/background graphics, control colors (buttons, check boxes, radio buttons) and more. Once you’ve got your project ready to go, the Publishing Wizard will help you to package it up and upload it to your server. The wizard will create the client application, server configuration files and everything else you need to put your update system into operation. You’ll also get a full project manifest that tells you what files have been generated and what you need to do with them. TrueUpdate 2.0 makes it easy to keep both your client and server files up-to-date. The new automatic upload feature turns the build process into a complete publishing solution. 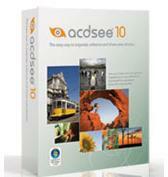 It supports file copying to UNC or mapped drives, standard FTP, or secure SFTP. Of course, should you wish to handle it all yourself, there is a manual upload option as well. Smaller and faster means a better experience, and TrueUpdate 2.0 delivers. Compare our tiny ~500 KB client application to the competition and see for yourself. And since it is written completely in optimized C++ code, there are no external dependencies or runtimes required. Both client configuration files and server data files are automatically compressed and encrypted using your own private key. Featuring the secure Blowfish algorithm, your scripts and configuration info are safe from any casual tampering or viewing. Your TrueUpdate 2.0 projects can be configured to operate without displaying user interface dialogs, prompts, messages or errors. Silent operation lets you maintain control over hundreds or thousands of workstations while enforcing corporate standards. The client application can easily be called from programs, system schedulers or automatic processes. TrueUpdate 2.0 can be easily expanded with Action Plugins. These plug-in modules can extend the product in infinitely powerful ways, such as adding support for SQLite databases, XML, MD5 hashing, data encryption and much more. Tight integration with the design environment �C including IntelliSense style code completion and syntax highlighting �C makes them just as easy to use as built-in actions. Plugins are available through Indigo Rose as well as third-party developers thanks to Indigo Rose’s freely available plug-in development kit. TrueUpdate 2.0 offers unsurpassed support for multilingual projects right out of the box. Update systems created with TrueUpdate 2.0 can automatically determine the language of the client operating system and adjust the display of screens and messages appropriately. Whether you need to support English, French, German, Spanish, Italian or any other language recognized by Windows, you simply provide the text and TrueUpdate 2.0 takes care of the rest! Now it’s easier than ever to make sure that typos don’t creep into your projects. Basically anywhere you can type, you can perform a spell check to ensure error-free text. Dictionaries are available for over a dozen languages including English, French, German, Italian, Spanish, Dutch, Swedish, Danish, Croatian, Czech, Polish and Slovenian. The client application can easily log each action giving you an accurate record of everything that is happening behind the scenes. It’s perfect for debugging or even archiving. You can control the level of detail being logged, including options for recording script actions. TrueUpdate 2.0 fits seamlessly into your daily build process. Creating your update project every time you build your source code makes it easy to test early and often. Used in conjunction with design-time constants (e.g. DEFINE’s) and build response files, your TrueUpdate project can be kept up to date simply and automatically. Update systems created with TrueUpdate 2.0 work just fine on every Windows operating system from Windows 95 to XP and beyond. Compare that to competitive tools and you’re sure to be surprised at their requirements. If you need to support legacy systems, your choice is clear!